Abdullah Gül has just been announced as the AK party’s candidate for president again. As anyone who has read anything about Turkey over the last few months will know, he was nominated by his party for the post in April and had to pull out after the most controversial presidential election in Turkish history. Unlike last time, this nomination comes from the AK party’s executive committee, and not the prime minister himself. One of Mr Erdoğan’s greatest mistakes last time was to stubbornly keep his choice of candidate secret until the last minute. He announced it a few hours before nominations closed, not even giving his party a chance to digest the news. This time, the party sat down and talked about whether it worth putting Mr Gül forward again. That is a good thing. Also unlike last time, it seems Mr Gül might have some opposition support. Cihan Paçacı, Secretary-General of the National Action Party (MHP), has said in the last few minutes that he does not “expect a crisis over the nomination”. This is not to say the MHP will be voting for Mr Gül, but they have decided to turn up and push attendance over that crucial 367 figure. That would be enough to elect him. Mr Gül is off canvassing tomorrow, beginning in the morning with MHP leader Devlet Bahçeli. He is also likely to visit the main opposition CHP and the Democratic Left Party, although both have already said they do not support him. CHP leader Deniz Baykal has described the MHP’s decision to attend the vote as “surprising”; Mr Bahçeli countered by saying: “What would our next move be if we did not attend and made it impossible to have an election? We cannot support using crisis and uncertainty to deal in politics.” He is absolutely right. The process is like last time: the first two rounds are on August 20th and 24th, where a candidate needs 367 votes to win. The next two rounds are on August 28th and September 1st, when a candidate requires just a simple majority. Under the precendent set by April’s abortive election, there also needs to be at least 367 MPs casting votes for the round to be valid. AK has a large enough majority to elect Mr Gül on August 28th, provided the MHP comes to watch. But with 340 seats (minus the speaker), they are 25 votes short of electing him in an earlier round. That gap could be easily bridged with MHP support. Another less likely option would be to cobble together the twenty seats of the pro-Kurdish Democratic Society Party with independents and rebels from other parties. Most likely is that Mr Gül will become president in the third round. The media in Turkey and abroad will probably interpret the renomination as AK defiance in the face of the CHP and the army. That isn’t the way I look at it. 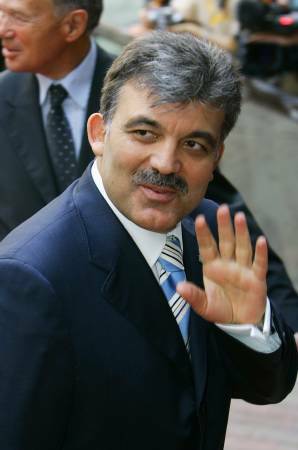 But the question that far fewer people seem to be asking is whether Abdullah Gül would make a good president. He is a capable man, aware of the country’s institutions, and is certainly no-one’s puppet. He is the Foreign Ministry’s loss. One of the most interesting developments over the past fifteen years is the way the MHP has been subtly embracing democracy. It started with Türkeş’s change of heart in the 90s, in the few years before he died, where he openly called for a more democratic slant to the party’s policy and image. The archetypal image I have of an MHP member is something between a Gazi University “reis” and a Nazi stormtrooper. But Bahçeli seems to be making an sustained effort to soften up the image, and drag the party more to the centre. I believe that the reason he is doing it is to grab a lot of the CHP support, and make the MHP the natural party for the nationalist movement. If so, it is a sensible move. The CHP are tainted with the stench of corruption, of unaccountability, of arrogant elitist contempt for the actual people who live in this country. They have effectively repudiated support in the South East through their tantrums and narrowness, and could, through their failure to see the real world, quite easily lose the West, too. However unpleasant and unreasonable I find the opinions and beliefs of the MHP, there is no doubt in my mind that they represent a real and important political position in Turkey. And Bahçeli is a good man to lead them. Yes, I predict the death of the CHP within the next decade and the softening up of the MHP as they hoove up Kemalist support. I didn’t think about this at length, maybe I won’t at all (unless it gains currency). But I wanted to share it with you guys. Take it for humor if you will at this time… To help the humor, remember Cindoruk’s monicker: DJINdoruk. Read more here at Hurriyet Online. Cindoruk is saying that as the process of changing the election format to that of a popular vote has started, it has to be finished before the election can happen. Sounds dodgy to me. How can an attempt to alter the constitution through referendum constitute an actual change to the constitution before the referendum has happened? Clearly the articles which were in force in May are still in force in the same way. Baykal is currently saying that attempts to railroad Gül into the job go against the “spirit of 367”, which is to force agreement between the parties before it comes to a vote. This is clearly rubbish, as the constution allows for a simple majority on the third vote, which it would not if it wanted the Meclis to be presented with a fait accompli. It would be fascinating to see if Baykal has the face to try to stop the election again, using Cindoruk’s elegant logic. Fascinating, that is, in the same way as watching a bus fly off a cliff road is fascinating. I’m not sure he’d dare. But even as I type that, I remember we’re talking about Deniz Baykal here. Not sure about Cindoruk’s plans, but it is looking very good for Abdullah Gül. In fact, if a few MHP members defect, he might just get elected in the first round. Not even Sezer managed that, and he was the consensus candidate. What I’ve liked about the last few days is that everyone has been playing by the book. Erdoğan chose to present the cabinet for approval to Sezer – he didn’t have to, he could have waited for his ally. And Sezer, who could easily have approved the cabinet as his last act as president, chose to defer the decision to his successor. He said his term was too near its end. By doing that he avoided hypocrisy, because it was Sezer’s circles who had said before April’s fiasco that the president should be chosen after a general election, as the (then) parliament was too close to the end of its term. For all his faults, Sezer does stick to his principles. DSP can be an alternative for people who are left-wing minded. MHP will be the centrist party and AKP will be the Centrist-right party. But in a couple of years I see a social liberal party emerging from the growing middle class who wants reforms, without religious interference. We saw this all over Europe the last 30 years. if im not mistaken the number 367 is needed to start the elections, which was 2/3 of the total representatives, and might have changed this time. i really have no idea how many seats there are in the turkish parliement. the number of votes needed to announce a candidate as the president is less than that. i am not sure on that but i guess it must be 1 vote more than the 1/2 of the representatives. That’s just about it. The first two rounds of a presidential election require 367 votes. Round three needs only a simple majority, which is 276. And after May’s court ruling, there needs to be 367 votes cast (one more than two-thirds of the total number of members, which is 550) for the round to valid. Walking through Istanbul with my Turkish friend last year, a secular woman, I watched as she was shunned by women with scarves who turned their backs on her. The rise of the AK party is giving the more religious Turks the support and impetus to force the country into an Islamist state. The election of Gul will only split the country further. He may be a moderate but he encourages and emboldens the more fundamental elements. It could have the effect that the military will feel the need to step in again to change the government. Look at the harsh language in the warning the military issued just yesterday. That would be a disaster to their EU hopes and for the economy.